Tregs are critical for controlling inflammation in the transition to an antiinflammatory decidual environment necessary for embryo implantation and progression of pregnancy. Mouse models show that Tregs act to suppress inflammation, prevent adverse effects of antifetal alloantigen Teff cells, and allow vascular adaptations required for placental morphogenesis (39, 41, 62, 63, 82, 87). Tregs arise as a consequence of events during the inflammation-like response in the periconception phase, and their abundance, suppressive function, and stability are impacted by events at conception and in the preimplantation phase (39, 83–85, 135, 137). 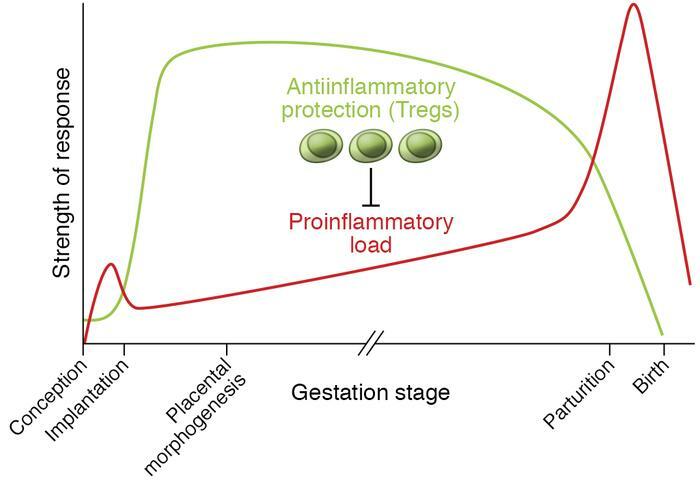 Tregs sustain an antiinflammatory environment until a decline, associated with the inflammation events of parturition and birth, is triggered (40, 64, 88, 89). Decidual Tregs in pregnant women show kinetics and regulatory mechanisms comparable to those in mice (36, 52–54, 56, 58, 59). Recurrent implantation failure, recurrent miscarriage, preeclampsia, and in utero growth restriction are all linked with insufficient numbers, reduced suppressive function and/or instability of Tregs (19–21, 23, 24), and excessive inflammation in the uterus and/or gestational tissues (21, 27, 80).